With Valentine's Day on the way say 'I love you' to someone special with a delicious box of quality Belgian chocolates from Guylian. Guylian provide a variety of chocolates made from a blend of the finest African cocoa beans. The praline centres, a combination of hazelnuts and milk chocolate, is so good it makes them award winners too - the shells and seahorses received 3 gold stars in the Superior Taste Awards! 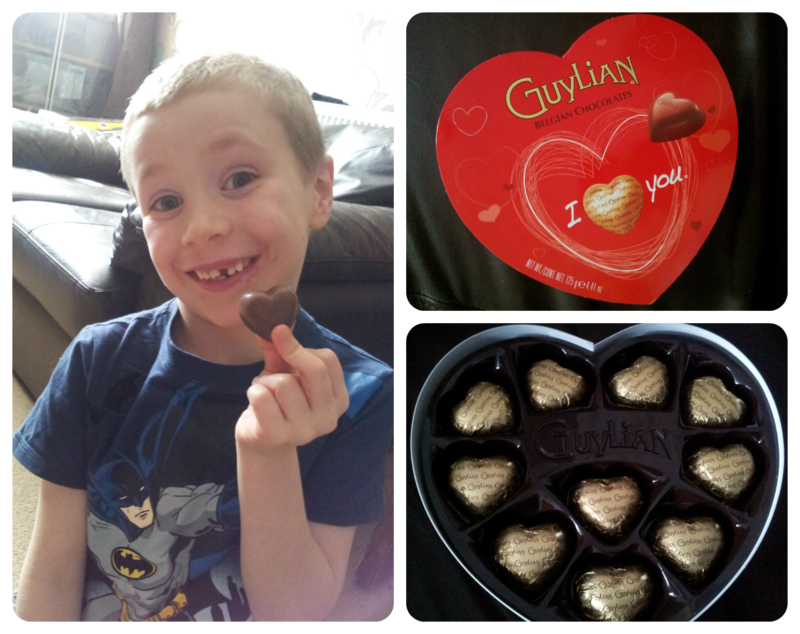 We received a box of the I Love You praline filled chocolate hearts to test from the Valentine's range and I barely got a look after the Mini Mes saw them and their eyes lit up! Presented in a heart shaped box the individually wrapped chocolates look luxurious in the gold foil. The centre melts on the tongue and provides a creamy and rich flavour. This brand is actually one of my personal favourites and they didn't fail to please. We have two sets of Seashells, Seahorses and hearts to give away so you can really treat someone this February. For you chance to win 1 of 2 Guylian chocolate bundles you can enter via the Rafflecopter entry form below. The competition closes on 10th February. a new car or an exotic holiday! I would do anything they wanted, if money were no object. I'd take them to Disneyworld! A balloon ride over the Alps! Yummy! Please and Thank you! We don't really do valentines as our wedding anni is week later. Therefore the best treat would be a week somewhere warm and sunny to cover both dates might be good. a holiday away for me and my husband and also a new car for him! I would treat my hubby to a honeymoon as we never had one. a night out with a limo driver and a special hotel package of a suite and a massage. I would take my hubby on a very romantic trip to Paris, we have both always wanted to go there but not had the chance! Thankyou for the tasty giveaway! A holiday in the Maldives! a holiday in disney florida for as many weeks as we could manage in a 5 stay resort with a personal chaffeur! i follow via email as talcfour. If money was no object, it would have to be a holiday to Hong Kong. I'm single, so I'd pay for a romantic date for my sister and her fiance. I'd buy my husband a Porsche, he has always wanted one and it's way down the list, waiting for that miracle lottery win!! a Great big engagement ring! I would buy him his own golf course! giving him as much money as he needs to go to oxford street and spend on an entirely new wardrobe! A meal at a posh restaurant & a chauffer driven car to take us & bring us back. A day out and a lovely dinner. A holiday to New York. A romantic trip to New York, go to Broadway, a lovely dinner and a 5 star hotel then wake up in the morning and go shopping! I'd take my husband to China to visit family. A meal out followed by a show and a night at a hotel. a holiday for us all! A holiday to the Carribean. a weekend in rome ! A holiday abroad in a 5* hotel. I would whisk my hubby away for a romantic weekend break. It's not so much money that is the object but babysitters lol! A surf trip to Hawaii! Help in tracing his birth family who he hasnt seen since he was 6! A trip to Paris which is what we were planning until the bathroom renovations went waaaaaay over budget! I would ride over the pyranees with him on a two week break but not bother to make arrangements just go wherever the will takes us. I'd buy a new car! A trip to the Ice Hotel. His idea of heaven, my idea of hell! A whole new wardrobe of clothes. A holiday if money were no object. I would treat my husband to a luxurious Caribbean cruise. I think we're well overdue for a holiday in the sun! She would like a huge diamond ring! I'd buy my husband a Bugatti Veyron! i buy my husband a Bugatti Veyron!